Aero L-29 Delfin Video - "Dolphin"
The Aero L-29 Delfx�n (English: Dolphin, NATO reporting name: Maya) is a military jet trainer aircraft that became the standard jet trainer for the air forces of Warsaw Pact nations in the 1960s. 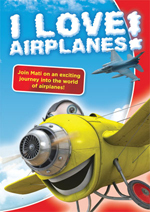 It was Czechoslovakia's first locally designed and built jet aircraft. In the late 1950s, the Soviet Air Force was seeking a jet-powered replacement for its fleet of piston-engined trainers, and this requirement was soon broadened to finding a trainer aircraft that could be adopted in common by Eastern Bloc air forces. 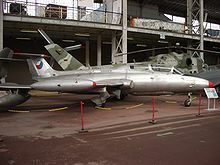 Aero's response, the prototype XL-29 designed by Z. Rublič and K. Tomx�� first flew on 5 April 1959, powered by a British Bristol Siddeley Viper engine. 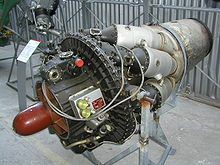 The second prototype was powered by the Czech-designed M701 engine, which was used in all subsequent aircraft. The basic design concept was to produce a straightfoward, easy-to-build and operate aircraft. Simplicity and ruggedness were stressed with manual flight controls, large flaps and the incorporation of perforated airbrakes on the fuselage sides providing stable and docile flight characteristics, leading to an enviable safety record for the type. The sturdy L-29 was able to operate from grass, sand or unprepared fields. Both student pilot and instructor had ejection seats, and were positioned in tandem, under separate canopies with a slightly raised instructor position. In 1961, the L-29 was evaluated against the PZL TS-11 Iskra and Yakovlev Yak-30 and emerged the winner. Poland chose to pursue the development of the TS-11 Iskra anyway, but all other Warsaw Pact countries adopted the Delfin under the agreements of COMECON. Production began April 1963 and continued for 11 years, with 3,500 eventually built. A dedicated, single-seat, aerobatic version was developed as the L-29A Akrobat. A reconnaissance version with nose-mounted cameras was built as the L-29R. Picture - A private L-29 Delfin at the 2006 Miramar Air Show. The Delfin served in basic, intermediate and weapons training roles. For this latter mission, they were equipped with hardpoints to carry gunpods, bombs or rockets, and thus armed, Egyptian L-29s were sent into combat against Israeli tanks during the Yom Kippur War. 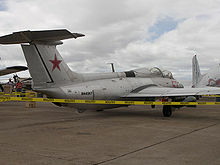 The L-29 was supplanted in the inventory of many of its operators by the Aero L-39 Albatros. More than 2,000 L-29s were supplied to the Soviet Air Force, acquiring the NATO reporting name "Maya." On July 16th, 1975, a Czechoslovakian Air Force L-29 shot down a Polish civilian biplane piloted by Dionizy Bielański that was attempting to defect to the West. On October 2, 2007, an unmodified L-29 was used for the world’s first jet flight powered solely by 100% biodiesel fuel. Pilots Carol Sugars and Douglas Rodante flew their Delphin Jet at Stead Airport, Reno, Nevada in order to promote environmentally friendly fuels in aviation. Between September 10-14, 2008, two L-29s took first and second at the Reno Air Races. Both L-29s consistently posted laps at or above 500 miles per hour. Former Astronaut Curt Brown took first in "Viper," followed by Red Bull Racer Mike Mangold in "Euroburner." Russia says it destroyed 2 Georgian L-29s during the 2008 South Ossetia war. The Afghan Air Force operated as many as 24 from 1978 to as late as 1999. The Armenian Air Force operated a few, which were withdrawn from service in 1996. Bulgarian Air Force operated 102 examples, delivered between 1963-1974, retired from service in 2002. Australia : One private L-29C,VH-BQJ. Based near Sydney, New South Wales. Gunston, Bill, ed. 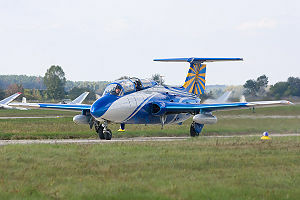 "Aero L-29 Delfin." 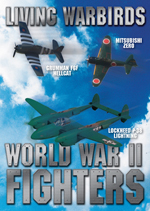 The Encyclopedia of World Air Power. New York: Crescent Books, 1990. 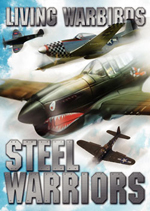 ISBN 0-517-53754-0. Taylor, John W. R. Jane's All The World's Aircraft 1971-72. London:Jane's Yearbooks,1971. 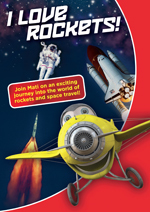 ISBN 0 354 00094 2.